Ugh, a two day migraine followed by a cold moving through my body waylaid me for a few days. Did the stairs quite a bit as new pup has learned how to go up but not down. Not enough to count as points. I did eat a big salad and had some steamed vegetables as well for seven servings. 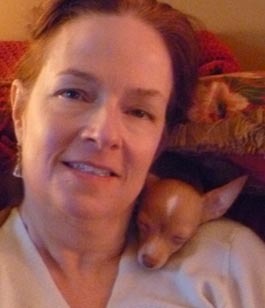 Her eis a pic of me with a lovely cold and my neck warmer, Rosie.